Invitation letters are the most diverse form of letter ranging from formal to informal class and are used at multiple occasions like for a business party, a wedding ceremony, to a birthday party and much more. There are a few mandatory things regarding an invitation letter these are as follows. First of all, you have to mention the organization or host’s logo at the top of the letter. The logo may be replaced by any graphic or name depending upon the scenario and requirement but it must always be at the top and clearly visible. Then the name of the host should be there on the letter. The name must exclude any honorifics unless or until it is an official site. If the event is hosted by the two or more hosts then their full name must be used for extending the invitation usually, formal wordings are adopted like “cordially invites you to attend” or “request your presence” etc. In the later part, you must provide information regarding the event like either it be an award distribution ceremony or a reception party, some formal dinner, charity meeting whatever it be you have to visibly specify it. In addition, to this event, you must also state the purpose of the event. Like if it is an award distribution ceremony, then why it is going to be conducted etc. It is mandatory to specify the date for the event regarding formal letters, however in the case of informal letters, such a situation can be avoided. The date can be written in either form or format depending upon the choice of a sender. As a formal practice write the time at which the event is going to be conducted besides this also specify either it be the morning, evening or any part of the day. In formal letters time must be written as “At eleven o’clock in the morning.” If the event is like a dinner party, charity lunch etc. then words like “morning”, “evening” can be avoided. Among several important things location of the event must be described in full like the address must comprise off the street number, area name, and the exact place name. In addition, if the reference of some nearby building is provided then it is considered as an additional item, however, writing in such a manner is considered good practice. 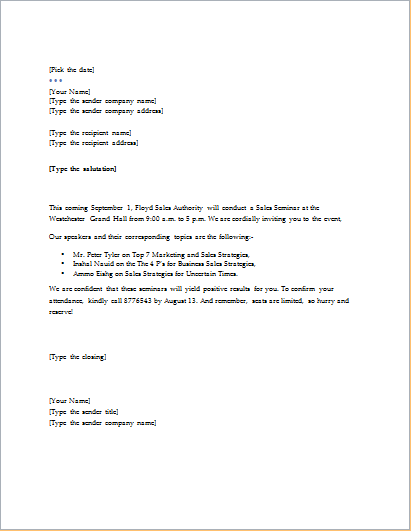 If the event has to arrange in some specific manner then its directions must be enclosed along with the invitation letter. These instructions may be related to a specific dress code that needs to be adopted for the party. 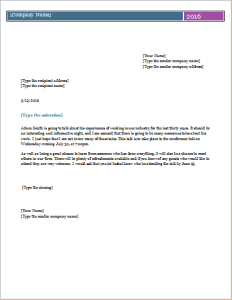 The above paragraph completes full information regarding an invitation letter however one may skip the things that he or she wants according to the needs and requirements of the situation. 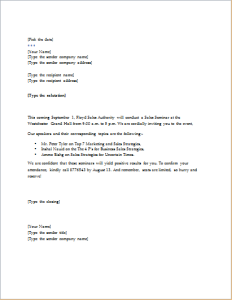 The instructions enlisted above related to the invitation letter are for a formal letter of invitation. For an informal letter majority of the things remains the same with the only difference in the tone and language in which the letter proceeds. 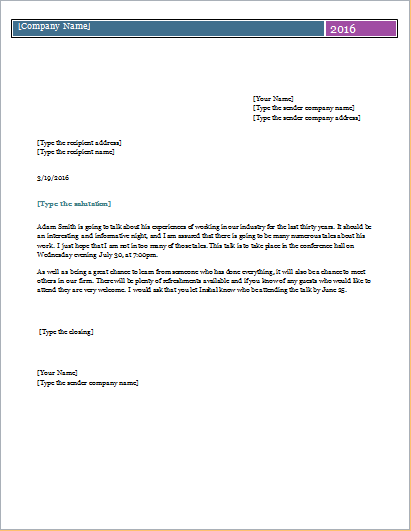 An informal letter may omit things like complete date, full address or the title included. Thus, it depends on the writer how he or she proceeds.